Most of the time only a few things really matter with respect to the outlook for the global economy. If one can work out what those key debates are, and how they resolve themselves, then the asset allocation and investment decisions should fall out of that analysis. That’s critical given that the equities vs. bonds decision in a global portfolio typically accounts for the significant majority of portfolio returns. So what are those key issues – and how will the Fed interpret them? Is this supposed broadening and synchronized global growth surge set to continue or will it be another false dawn? 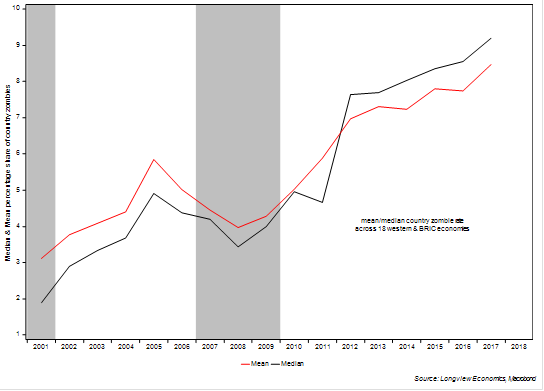 And as a subset of that question, has China really managed its way through its over-indebtedness, or is current growth simply a short term respite? Why is wage inflation struggling to accelerate across Western economies, despite seemingly tight labour markets? Why has consumer price inflation remained ‘persistently low’ (to quote Yellen) despite concerns in some quarters at the start of QE in 2009 that money creation would lead to high, or even hyper, inflation? Why is productivity growth trending at, or close to, zero? & is it even measured correctly? 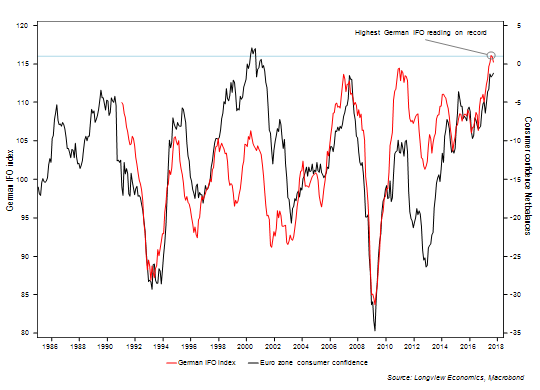 Indeed one could take that second question one step further and ask why, despite a 12 & 13 year high in the two US ISM surveys and a recent all-time high in the German IFO survey (FIG 1), are US and German 10 year bond yields still close to multi century record lows? If one accepts two simple assertions/observations, those four issues begin to make sense. 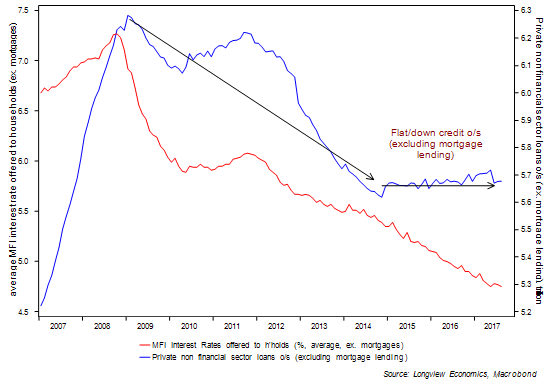 Assertion no 1: the West is in the midst of a debt deflationary phase (which is an overhang from Western monetary policy of the past 25 years). Observation no 2: Western societies are aging (and in some instances shrinking). Indeed low real wage growth has historically been correlated with low productivity growth, while low productivity growth is a typical outcome of money creation and over-indebtedness. The Western approach to the debt crisis has been to flood the system with cheap money in an attempt to stimulate the economy. As FIG 2 illustrates, though, this doesn’t stimulate as it fails to encourage any more borrowing or any more investment (indeed in certain instances it encourages the opposite). What it does, though, is keep zombie businesses alive, and allow them to become a significant part of the corporate base (FIG 3). As such the process of creative destruction is forestalled, the corporate base of businesses is weakened, investment is undermined and therefore productivity growth slows. In that respect, Schumpeter had much to say. Given that weak corporate base, low productivity growth and overindebted state of affairs, the economy becomes particularly sensitive to any monetary tightening. As a result, as more rate hikes are priced into the short dated part of the curve (i.e. as per the past few weeks), then the curve flattens with 10 year yields falling as two year yields rise (unlike prior cycles when 10 year yields have typically risen but slower than 2 year yields – i.e. an accentuated version of Greenspan’s bond yield conundrum). 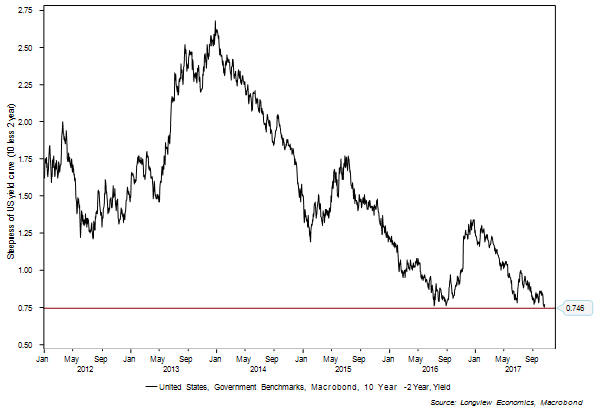 As of this week, for example, the US yield curve (10 less 2 years) had reached its flattest since before the crisis. Indeed the curve has broadly been flattening since the start of tapering in 2014. The optimists point to the dramatic technological revolution which is both underway and undeniably significant. If the economy was really much more productive than the data suggests, though, then return on equity should be high and an investment boom should have resulted as companies seek to compete away excessive returns. This, though, has clearly not happened. 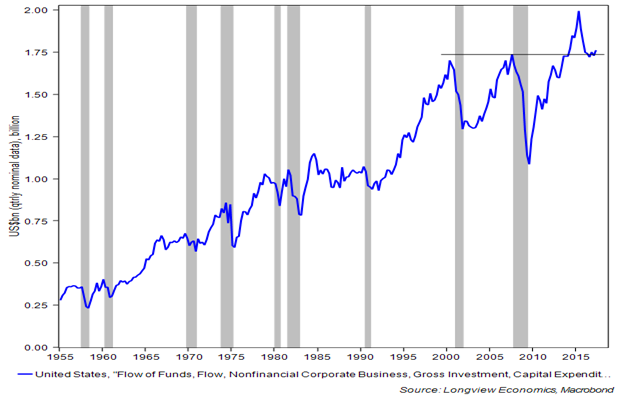 US investment spending, for example, once adjusted for inflation, is currently at the same level as it was at the end of the last two economic cycles (i.e. in 2007 and 2001 – FIG 5). So why is everyone SHORT bonds? Interestingly this week, the Merrill Lynch fund manager survey was published. Its key finding was that 83% of investors expect US 10 year bond yields to be higher over the next 12 months and only 3% expect yields to be lower. That finding is consistent with the JP Morgan survey which showed that the highest percentage of their clients since 2006, are net short bonds. Crowded trades, of course, are dangerous trades. Once a trade becomes a crowded consensus, its trend tends to be reaching an exhaustion point. Observationally that fits with the recent inability of bond yields to move to new highs despite strong macro data. It would also fit our debt deflation thesis and our expectation that global growth rates have peaked for now, and are set to slow. A weakening Chinese housing market is one key factor driving that, as is the effect, of euro strength upon the Euro zone economy. Observation no 2: Ageing societies don’t borrow money: Whilst not especially original, it’s interesting to note the work of the UK’s FCA. This week, in a report titled: “Understanding the financial lives of UK adults; Findings from the FCA’s Financial Lives Survey 2017” (available HERE), the FCA analysed the debt life cycle of the different UK adult age groups. This confirmed what we have all been discussing for many years, i.e. that the lifetime cycle of consumption and borrowing peaks at around 40. The average unsecured debt (excl. student loans) is approx. £1,460 for 18 – 24 year olds; for 25 – 34 year olds it rises to £4,200 and then peaks at £5,130 for the 35 – 44 year age group. For 65 – 74 its £1,580 and then £540 for over 75 year olds. Given that unsecured debt almost always translates into consumption (of some sort), it’s clear how demographics are relevant to an economy’s consumption patterns. Hence why the current ageing Western populations are consistent with lower economic growth & lower bond yields. Given that popular SHORT view on bonds, it’s perhaps not surprising that the bond proxies are so out of favour. The US staples sector, as highlighted in recent weeks, appears to have lost its typical correlation with bond yields. This is purportedly due to significant structural issues (the Amazon effect). Telecoms have also been written off as having severe structural problems. At some stage, though, those issues will be in the price. Of interest, three of the four defensive sectors are the most oversold sectors in the global market. If we’re correct on the direction of bond yields, the beneficiaries should be those defensives (RSI Heatmap below).